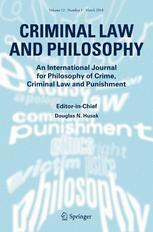 "Hoskins’s New Benefit-Fairness Theory of Punishment"
Abstract: The benefit-fairness theory of punishment (sometimes referred to simply as the “fairness” theory of punishment), which is one of the most prominent retributive justifications of punishment, appeals to some benefits received by an offender in explaining why it is fair to impose punitive burdens on him. However, many see the two traditional versions of the theory, found in the works by writers such as Herbert Morris, Jeffrie Murphy, and George Sher, as being susceptible to fatal objections. In a recent paper, “Fairness, Political Obligation, and Punishment,” Zachary Hoskins offers a new version of the benefit-fairness theory of punishment. I will highlight his original contribution by showing how his version of the benefit-fairness theory of punishment is different from the traditional versions in such a way that the main objections applying to the traditional versions do not apply to his account. Nonetheless, despite its many virtues, I will argue that Hoskins’s theory fails because it would entail disproportionate punishment.